Standing Room Only Productions, Inc. presents. . . .
Paco ”El Picante” an undercover officer checks tourists crossing Mexico’s border. It’s not certain which side he’s really on, but what ”is” certain……he’s got full control of Maya’s affections……which does not sit well with ”El Malo”! 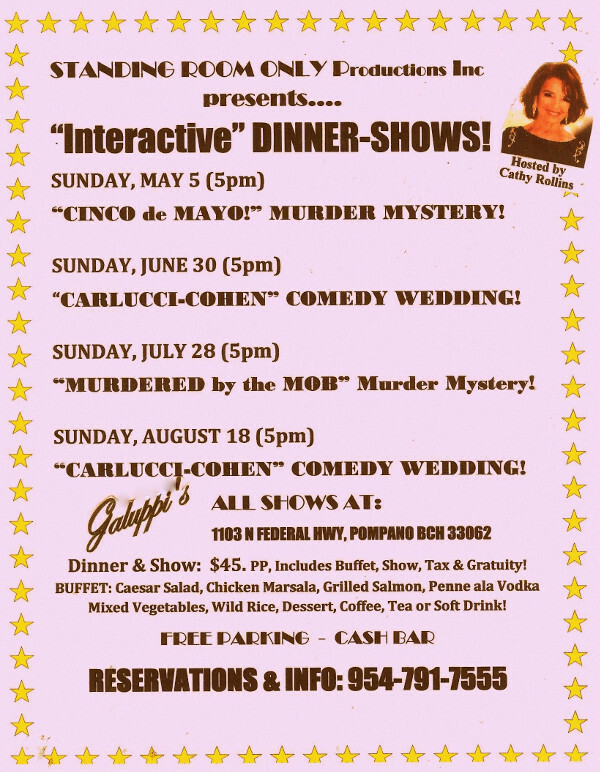 Come celebrate Cinco de Mayo with a delightful and fun-filled interactive Murder Mystery by Standing Room Only Productions at Galuppi’s Restaurant & Patio-Bar on Sunday, May 5th at 5pm. This entertaining dinner-show puts you smack in the middle of mystery and intrigue along with Mexican music and mysterious Mexican characters. Be prepared as your table will be asked to try to solve the crime! Great food, entertainment and a fun event! Dinner and Show: $45 per person, Tax and Tips included! Checks Payable: Standing Room Only Productions, Inc.